Famous for being one of the most romantic destinations in the world, you would think that the Maldives have a plethora of adults-only resorts from which to take your pick. In fact, high-quality adults-only resorts are not as popular as you may think. However, there are a few special adults-only resorts which really stand out and offer an idyllic getaway from any honeymooners or loved-up couples looking for a quiet and romantic getaway. Read on to find out our top pick for the very best resorts in the Maldives. This magnificent Kuredu Island Resort is divided into three main sections: One is available to all guests, the second area is open for adults and children over the age of 12, while the last area is adults-only. The thing about this resort is that the adults-only section contains everything that you need for a quiet peaceful and romantic vacation. Kuredu Island Resort and Spa is actually one of the oldest resorts in the Maldives. It was actually built in the 80s, but you would actually never know that from looking at it. All the villas in rooms are incredibly well-maintained and look relatively new with the little taste of that rustic charm which helps to add to the laid-back Vibe of this Resort. The island is actually quite large compared to other mega-resorts. You can choose to explore it by foot, by shuttle cars, or by bicycle if you prefer to get around on two wheels. What sets this resort above the rest is the sheer amount of a amenities and facilities that are available. There are no less than 4 gift shops, a jewelry store which is open around the clock, badminton volleyball and tennis courts, as well as a soccer field, a gym, three pools, a dive center, and a games room with table tennis and chess. There are several rather impressive restaurants dotted around the island, each serving a range of European, Asian or Maldivian favorites. Inclusive package includes a range of alcoholic drinks, as well as the option to dine at the a la carte restaurant for a small additional add-on fee. Room service is also available here, plus a nice touch is the ice cream stand that offers a selection of delicious, creamy gelatos. If you like to enjoy a tipple or two then the bars here are sure to impress. Non-drinkers can try the fresh fruit juices or sip on something at the tea house which is located at the end of the arrival jetty. 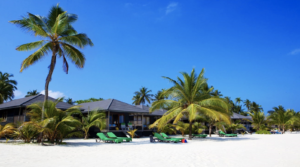 Click here to take a look at more photos of Kuredu Resort, and to book your stay. Opened in 2013, this relatively new resort shines with its fun atmosphere and gorgeous villas. Centara are a big-name brand who are famous for having some of the most luxurious high-end hotels and resorts throughout Thailand. In fact, currently, they have over 73 properties in Asia, each with Incredible reviews and welcoming genuine Thai Hospitality. 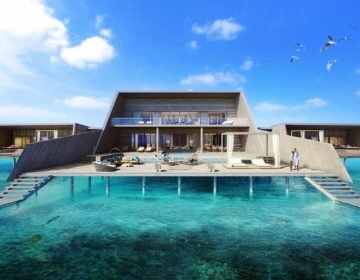 The Maldives Centara Ras Fushi Resort & Spa certainly wows with its range of amenities, stunning design, and wonderful service. A great benefit of choosing to stay at this resort is that the only a 20-minute boat right away from the International Airport. This means that you can simply whizz through arrivals and then hop on a speedboat to get to the island quickly. If you’re thinking of booking a stay at Centura Ras Fushi, you can choose from 140 different rooms. All rooms have been designed and positioned to ensure that they have breathtaking panoramic views. If you are a water lover, and really want to experience staying in one of those traditional stilted villas, then go for the ones located on the jetties. There are also mainland villas which are located around the pool area or along the sugar sand beaches. Different room types are available and offer something for each budget, and you will actually be surprised at how economical some of the rooms are compared to the other luxurious resorts located within the Maldives. No matter what type of room you choose to go for, you will be blessed with a range of in-room mod-cons including a huge flat screen TV, mini bar, coffee and tea making facilities and some lovely fluffy bathrobes to boot. Choose to go for one of the higher-end rooms and you can have a jetted outdoor tub and a private decking with hammocks, hot tubs, and daybeds. The all-inclusive packages are generous; menus change daily and include a range of different cuisines and themed nights too. There is also 24-hour room service available, so you can rest assured that you will never feel peckish on this island! Much of the dining options are based around buffets, but the spreads are incredibly large and include a range of bread, dishes, entrees, desserts, and drinks. There are also three bards located on the island where you can sip on sundowners and soak up the view. 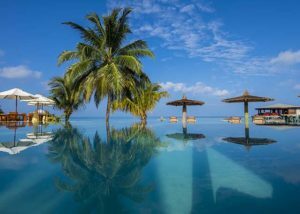 If you’re looking for wallet-friendly Maldives all-inclusive resort that is purely adults-only, then Centara Ras Fushi Resort and Spa Maldives could tick all the right boxes. Click here to get the best rates on your stay. Komandoo Maldives Islands Resort boasts multiple amenities and an incredible postcard-perfect setting. This stunning tropical hideaway is located on a private island with paper-white sand beaches and its own turquoise lagoon. This adults-only resort is a firm favorite with European guests, partly because of its exquisite cuisine, top-notch service, and charming Maldivian design. The spacious rustic villas have everything you need to have a convenient and memorable stay. In your beautifully designed villa you’ll find handcrafted furniture which reflects the local design, and perfectly complements the rustic vibe of the island. Rooms come fitted with super fast Wi-Fi, a mini bar, air conditioning and Incredibly comfy beds for a dreamy night’s sleep. As expected from such a highly rated resort, Komandoo Maldives Island Resort has a wide variety of excellent dining options to choose from. For breakfast, guests can enjoy a very generous buffet which includes exotic fruits, freshly baked bread, an egg station, selection of tea’s, coffee, juices, European favorites and much more. The breakfast is included for free with all stays, and you can choose from half-board full-board or two all-inclusive packages depending on your budget and needs. 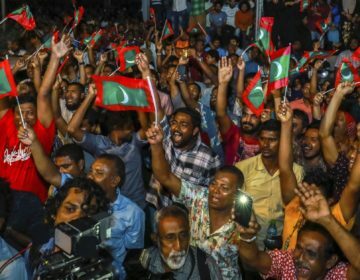 If you’re feeling a little unsure about what type of package you will need, you can check out our all-inclusive vs full-board Maldives post to find out the pros and cons of each. Unlike some of the other sleepy resorts, here you’ll find a huge range of activities to keep you entertained throughout the day and night. There is a huge selection of free classes included which can include fun things such as Sushi making, fruit carving and learning how to create Maldivian handicrafts. There is also a fully-equipped gym which is open 24 hours, a water sports center where you can have free access to kayaks and more, plus there is even the option to book a photoshoot or Sunset Cruise for you and your loved one. After the sun sets over the glassy ocean, you can choose to watch a live band, stomp your feet under the stars to some International DJs or even watch a traditional Maldivian dance. The activity program here is incredibly varied – check with your concierge to see what is on during your stay. It’s worth noting that it does take a 45-minute seaplane flight to get here, which is slightly longer than many other resorts – but we aren’t complaining. The flight takes you over speckled deserted islands and azure waters, which is all part of the adventure. Click here to see more photos and book Komandoo Island Resort. Last but by no means least is the Meeru Island Resort and Spa. This stunning Resort features incredible sandy shores, fringed by swaying palms and surrounded by those shimmering waters. The result is a laid-back resort which combines contemporary cool with Maldivian chic. Guests are given the option to upgrade or downgrade their add-on package choice on arrival at the island. So say you choose a half-board package and on seeing the incredible facilities and other goodies on offer, you can simply choose to sign-up for the all-inclusive option instead. The Meeru Island Resort is home to 286 rooms and has an adults-only section on the island (as well as one where all ages are welcomed). However, the adults-only section does contain all that you need to have an isolated stay away from children. If you’re on a budget choose one of the beachfront villas. There are a number of traditional over water villas on jetties to choose from too. A real highlight of this island has to be the two jaw-droppingly beautiful honeymoon suites. Unlike many other resorts with jetty-based villas, these to honeymoon suites are located privately out to sea and require a boat to get to. They come with a large living and dining room space along with the enormous bedroom, plus a private pool area with sundeck, sun loungers, and parasols. Facilities are plentiful and there are not one but two spas located on Meeru Island. The adults-only section one is actually located over the water and provides a luxurious and serene space to enjoy a treatment in one of the five beautiful rooms. There is also a nail spa and hair salon here, so you can keep your locks looking luscious during your stay. 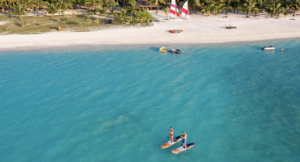 Keen divers will be looked after in the dive center, while in the water sports center you will find a range of non-motorized water sports equipment, including kayaks, catamarans for hire, and the option to learn how to windsurf. If you prefer being on dry land and you may want to head to the tennis courts try beach volleyball, work out in a 24-hour fitness center, or even tee-off in the 9-hole golf course. There is also a football field and on occasion, there is a staff versus guest friendly football games that you can take part in. Night owls are entertained, as when night falls a 24-hour bar livens up a crowd who enjoy upbeat music under those twinkling constellations. There’s also a romantic and low-lit relaxation area which is perfect for a date with your loved one. Their all-inclusive packages also generous, and you can choose to dine at one of the two main buffet restaurants which have a huge selection of dishes to sample for breakfast, lunch, and dinner. These Buffet options will change daily, and there are special themes throughout the week. For example, on Friday night’s there is a special Maldivian theme tonight where staff wear traditional dress, and you can try local favorites. There is also a sweet little cafe which is just located next to the pool. Here you can find a selection of sandwiches, ice creams, and coffees to satisfy your cravings. Click here to check out more photos of Meeru Island and to check out the latest deals. So these are our top picks for the best adults-only all-inclusive resorts in the Maldives. 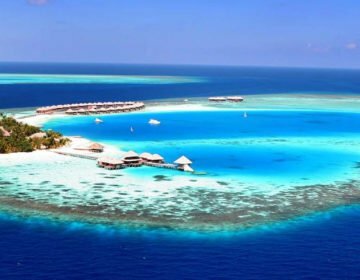 Of course, there are more to choose from: Some others you may want to take a look at include COMO Cocoa Island Resort, Conrad Maldives, and the charming Andara Island Resort and Spa. Hopefully one of those stunning Maldives resorts takes your fancy. No matter what you choose, an adults-only vacay to the Maldives is sure to be one to remember. Happy travels!